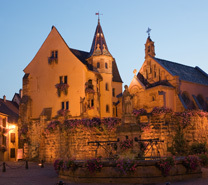 Eguisheim, the village in which the Domaine Charles Baur is to be found, is situated 5 kilometres to the south west of Colmar. Surrounded by vines and recognised as the cradle of the Alsace wine region, Eguisheim is to be found at the foot of the “Mont Schlossberg”. The earliest traces of human activity in the village date back to the Cro-Magnon times (there is a display on the Homo Egisheimiensis in Colmar’s Musée Unterlinden). Later the Celts followed by the Romans built an encampment in Eguisheim and cultivated the first vines. 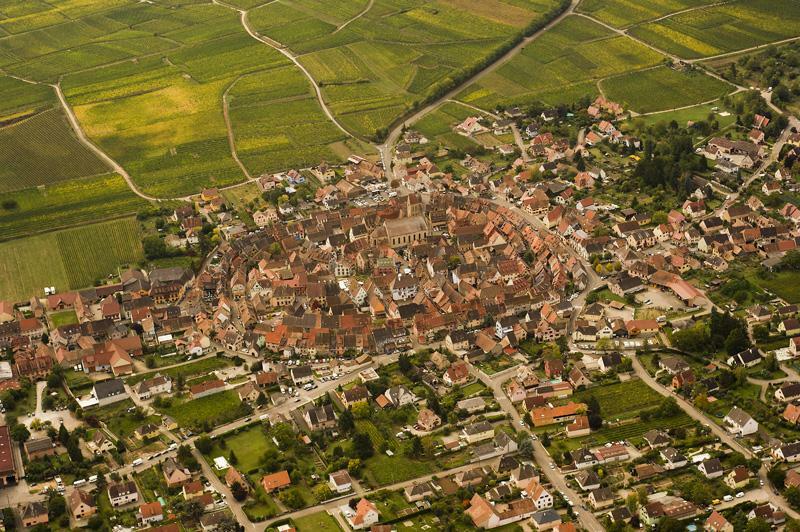 In the centre of the village is the 8th Century castle built by Count Eberhard, son of the Duke of Alsace. The Counts of Eguisheim were powerful and influential and several of their descendants became rulers of European countries. 1002 saw the birth of Bruno d’Eguisheim in the castle. He was to become Pope Leo IX in 1049 during whose papacy the medieval church underwent reform. In 1251, the “Castrum Egenesheim” or Eguisheim castle became a fiefdom of the bishop of Strasbourg. From 1257 onwards, fortification took place and the inhabitants from the surrounding areas moved into the now-protected village to better ensure their safety from attack. Having survived an attack from Emperor Adolphe of Nassau in 1298, the village was not so fortunate in the 15th Century when it was plundered and destroyed twice in 1444 and 1466. The 1466 attack saw the destruction of the Trois Chateaux at the summit of Mont Schlossberg. There is uncertainty as to the origins of the Trois Chateaux, some believe that they were first built as long ago as the 7th Century whilst others think that they were constructed several centuries later by Hugues IV of Eguisheim, the father of the future pope Leo IX. 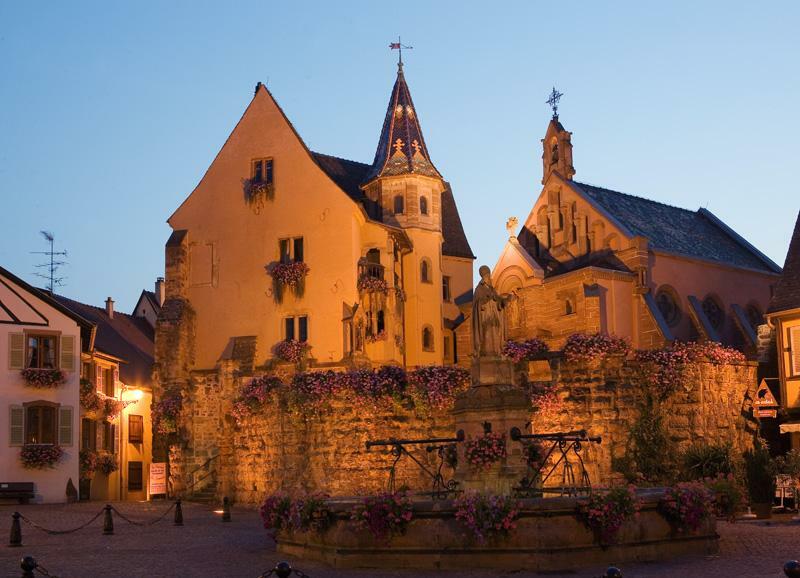 Following the end of the Second World War, the townsfolk made huge efforts to make Eguisheim more attractive visually, more welcoming to visitors and focussed on the production of high-end wines. Many of the houses began to be decorated with colourful flowers and, in 1965, the village was awarded first prize in a national competition recognising the success of the floral displays. This initial award was followed by another nationwide first prize in 1989 for the village’s appearance and a gold medal at European level in 2006 when Eguisheim carried off the Concours Européen de l’Entente Florale. 1975 saw the awarding of the coveted Grands Crus d’Alsace recognition for the two most prestigious slopes in the village – those of the Eichberg and Pfersigberg. 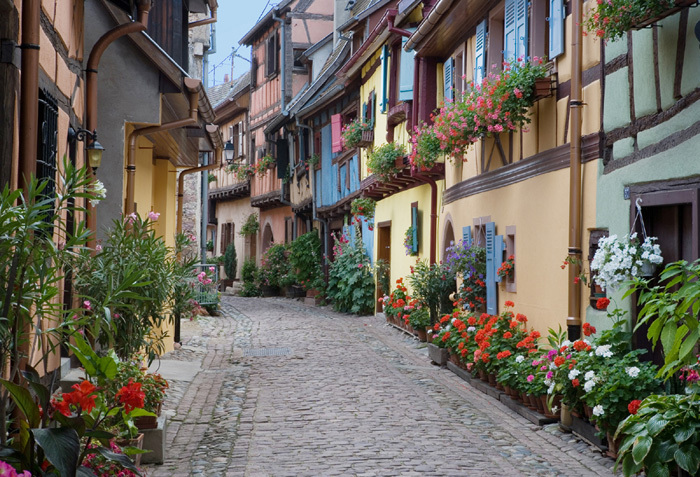 Since 2003, Eguisheim has been officially recognised as one of France’s most beautiful villages and in 2013, was awarded the title of the country’s favourite village (Village Préféré des Français) following a popular vote and broadcast on the national TV channel, France 2.